When it comes down to it, THIS is why we play Sci-Fi roleplaying games, right?! There's nothing quite like the feeling of a 'lightsword' in your hands. 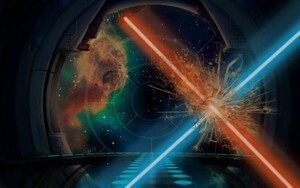 Whether you're bouncing blaster bolts back at hapless storm troopers or performing a perfectly cauterized head removal (not a speck of blood anywhere to scare the kiddies), the "Lightsword Battle" SoundSet is just "what you are looking for". With high energy sci-fi battle music, the clash of 'lightsword' on 'lightsword', startup and shutdown sounds you'll just want to keep spamming and a cacophony of artillery and blaster shots this SoundSet is something you'll really 'SABER'.